The film featured tight close-up studies of fifteen bare male and female bottoms in motion, showing ten seconds of each, as they slowly walked on an unseen treadmill. The motion was rhythmically edited, not skipping a beat. It was later compared to the motion studies of Muybridge. The short film features the bottoms of Susannah Campbell, Philip Corner, Anthony Cox, Bici Hendricks, Geoffrey Hendricks, Yoko Ono, Ben Patterson, Jeff Perkins, Susan Poland, Jerry Sablo, Carolee Schneeman, James Tenney, Pieter Vanderbeck and Verne Williams. It premiered at the Film-Maker’s Cinematheque, New York on 6th February 1966. (Yoko met John Lennon nine months later, just before her first London art exhibit, Unfinished Paintings, Nov. 8-18 1966 at the Indica gallery, co-owned by John Dunbar, Peter Asher and Barry Miles). The second, now infamous eighty-minute version of FOUR was filmed in Swinging London in Yoko’s friend Victor Musgrave’s townhouse. It included many more famous and infamous bottoms (conceptually 365). The credits list many London scene-makers, including Richard Hamilton, who later designed The Beatles (white album) cover. The film’s casting quickly became an event by word of mouth and an advertisement in the influential English underground newspaper IT (International Times). Talk of Ono’s film was a popular amusement in the press every day. Now, due to her colleagues’ contributions, Ono could afford more sophisticated camera equipment. The close-ups, framing only the buttocks, are more controlled. It cost of 1,000 pounds to produce. 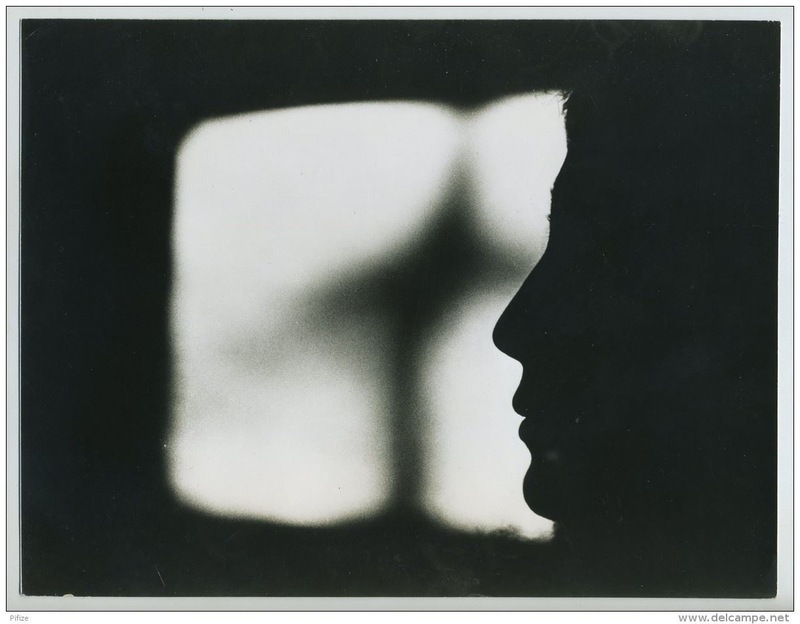 Because she felt that the sequencing was very important, Yoko spent many hours editing the film in a studio that she was allowed to use for free, after midnight. FOUR has an amusing soundtrack consisting of shy giggling and commentary of the actual participants, intellectualizing the film’s absurd concept in relation to the art world. The soundtrack also included audio from television news coverage, and Yoko voicing the concept of the film. A cast of approximately one hundred men and women (Yoko’s friends, artists and musicians) ‘saints of our time’ walked on the treadmill. Their bottoms were framed close-up, dividing the screen into four moving quadrants. There are conceptually 365 bottoms to coincide with each day of the calendar year. 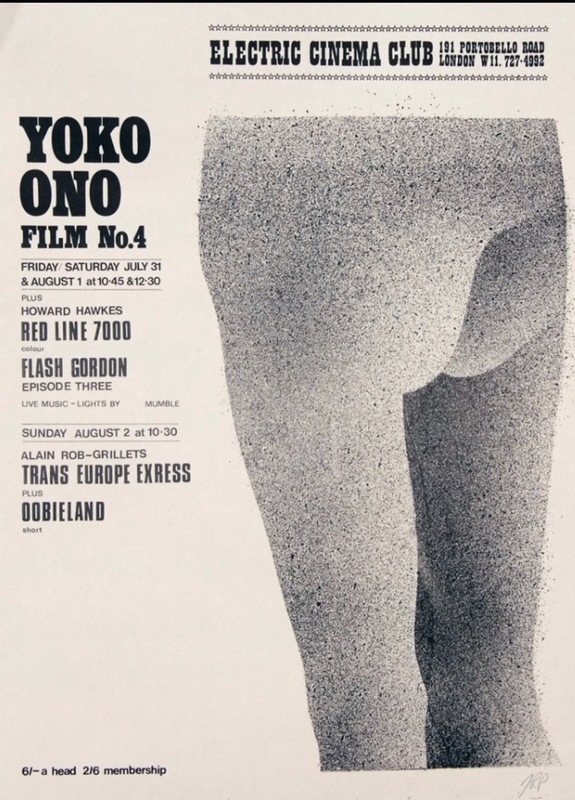 A humorous film trailer was produced, with the actual participants commenting about their own bottoms, about art, and shots of Yoko editing and filming. The censorship caused sensational and valuable media coverage, especially by BBC newsmen, who were enamored by Yoko and her film. One television station actually showed three minutes of the banned film on the evening news, as part of the censorship story – the best advertisement of all! 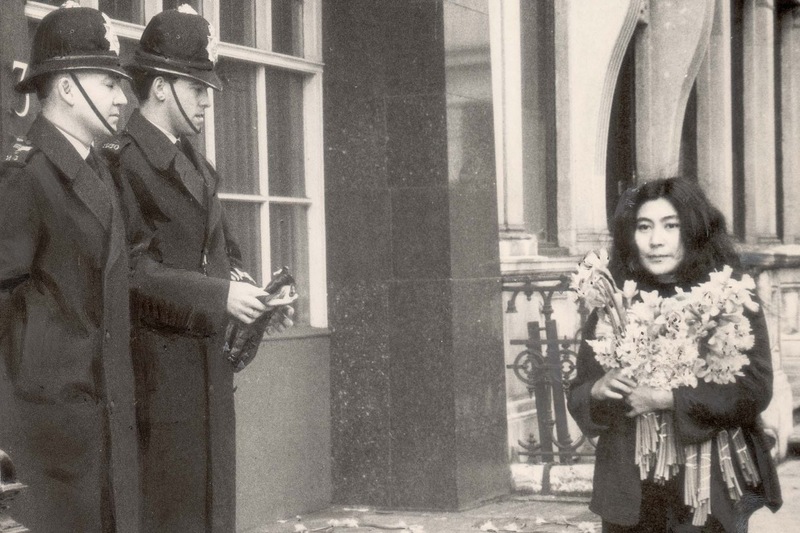 When Yoko was invited to enter the censors’ offices, she found that her daffodils were displayed on each desk. She had won them over. Bottoms was granted a Local X rating by London council and screened in cinemas. Now she was excited to begin her mooning of the art world! The film premiered at the Jacey – Tatler Cinema on Charing Cross Road, 8th August 1967. After the movie, Yoko gave a short talk. She hugged and kissed each person as they left the theater, whether or not they stayed until the end. Due to the attention that Ono was garnering (both good and bad), her avant-garde colleagues were not pleased, thinking that she had sold out. Now, at age 84, Yoko petitions for peace with smiles. In April 2017, the ban was lifted, and the film was shown at Royal Albert Hall!